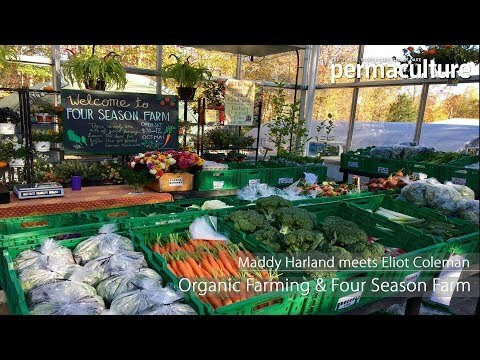 Elisabeth Winkler explains the various biodynamic methods used on Rush Farm in Worcestershire to restore the soil's fertility for abundant crops. This is the story of the role biodynamic methods has played in restoring a farm's fertility. Certified as biodynamic by Demeter and organic by the Soil Association, Rush Farm is a 150 acre family farm in Worcestershire. What used to be a wheat farm under a monoculture regime is now a lush diverse mixed farm. The wetlands of Rush Farm reach the borders of its ancient wood, and native Hereford cattle and Lleyn sheep graze on herb-rich meadows and pasture. Its top soil, once barren and brick-like with hardly any humus, is dark and crumbly. You want to pick it up and run it through your fingers. Like organic farming, biodynamic farming developed in the 1920s to repair the damage caused by the growing threat of chemical farming. Biodynamic methods owe their origins to Austrian philosopher, Rudolf Steiner, whose lectures to farmers concerned about soil erosion left a legacy of practical means informed by anthroposophy, “the spiritual science”, which Steiner founded. Biodynamic agriculture distinguishes itself from other ecological farming methods (such as organic and permaculture) in three main ways. It uses a planting calendar based on the documented influences of the moon, planets and constellations on plant growth. It uses minuscule doses of plant-based preparations (of which more later) to enhance soil and plant health. And it has a stated spiritual belief in the interconnectedness of all living things. The farm’s soil fertility, plant growth, and animal welfare are interrelated, and seen holistically as an organism in its own right. “It is in the play of the life forces as they move between the organisms, converting dead minerals into living plants, that the biodynamic farmer is focused,” says Sebastian Parsons, who bought Rush Farm with his sisters, Tabitha and Sophie, in 2005, and converted it to biodynamic and organic cultivation. Sebastian comes from a biodynamic family. His maternal grandfather, David Clement, was a biodynamic pioneer, whose farm was the Biodynamic Association’s headquarters from the 1930s to 1980s. Sebastian’s mother Anne, (daughter of Clement), was brought up on the farm, and embraced the biodynamic philosophy. Anne Parsons was secretary of the Biodynamic Agricultural Association from 1988 to 1994. During this period, she also distributed biodynamic preparations with the help of her then-young children, Sebastian, Tabitha and Sophie, who packed envelopes with plant preparations to be dispatched round the world. Anne was also involved in developing Demeter’s legal certification standards in the 1990s. In many ways, Anne Parsons embodies biodynamic principles. She and her husband, Adrian, now in their seventies, have been farming Rush Farm under its wise principles since their three children bought it. With its fertility and diversity restored, the farm is a sanctuary for wildlife; it encourages lapwings and curlews and is frequently studied, one such organisation is the Royal Society for the Protection of Birds. What exactly is biodynamic farming all about? Sitting at the farm kitchen table, Anne explains the mysterious concoctions in a delightfully down-to-earth way. She focuses on the role of the nine biodynamic preparations in helping restore Rush Farm’s soil fertility, helping its cereal and vegetable crops to flourish. Numbers 500 and 501 preparations prepare the fields, while the remaining seven (502 to 508) enhance the humus content in a compost heap. "Giving them numbers was a conscious decision to make them sound matter-of-fact," she says with a smile. Basically fermented cow dung with billions of microscopic bacteria, fungi and other micro-organisms, this preparation mixed with water was sprayed on the soil every month for two years to promote microbial life. "It made an incredible difference, most clearly in the garden at first. People thought we had put in extra compost," says Anne. At Michaelmas, (ancient festivals linked to equinoxes and solstices are part of the biodynamic farming calendar), the farm team collects fresh cow pats from cows that have calved, to fill 200 cow horns. "The cow pats and the horns have unique qualities that lend themselves to the natural process of transforming the cow pats into medicine for the soil and increasing soil microbial life, what scientists call the soil web of life," says Anne. The farm team bury the cow horns pointy side up in holes five inches or so deep. When they are dug up after about six months, their cow pat content has mysteriously transformed, "from green and smelly porridge to a brown-black crumble with a nice peaty smell," says Anne. "Just as 1g of rich soil has a billion micro-organisms, a biodynamic spray will have microscopic amounts of bacteria and fungi. On one hand it is quantitive," says Kai Lange who teaches biodynamic methods at Ruskin Mill College." And on other hand it is energetic – that is, the quality which goes beyond the physical body. But you do not need to believe in biodynamic methods for them to work," he adds. This horn manure, made with powdered silica, is for plants. Anne fetches a jam jar filled with ground-up quartz, a common white stone. "Silica is a mineral that brings balance, it improves nutrition, giving an indication to the plant of how to grow. You mix it to a slurry with spring water and bury it in a cow’s horn from spring to autumn," she says. It is sprayed on the fields in a similar way to Preparation 500. The remaining preparations are used to enrich the compost heap, which is created by layers, ideally alternating strawy material with green waste, and lime or slurry. You add a pinch of the six different plant preparations in tiny holes in the compost. Finally spray the heap with diluted juice from pressed valerian flowers. "It acts as an overcoat that holds in forces you are hoping to create," says Anne. Spraying is done with a hearth brush or fir branches. “It’s like t’ai chi, you go up and down the field with slow arm movements spraying the soil, or the plants, with droplets,” says Anne. For larger areas, such as fields, then knapsack sprayers or a sprayer on the tractor are used. Collecting cow pats, burying and diggings up horns and spraying are community activities for the farm team. “They are proud to be part of this set-up which has turned a rather barren patch of earth into something quite different,” says Anne. Rush Farm and its eco-business park are a community-owned farming trust (community shares available to public. Visit http://stockwoodcbs.org for more information).